YOU KNOW I LIKE ELECTION SIGNS but sometimes I feel I’m the only one who does. I view them as part of election-campaign excitement; others think they’re visual pollution, a blight on the landscape and should be banned. Some people feel so strongly about it they deface the signs with spray paint or rip them out of the ground — some even steal the plywood backing from the bigger ones. It’s true that they spring up like big, colourful weeds during campaigns, cluttering up road rights of way, hillsides and private lawns. I understand the aversion to campaign signs, but they’re only temporary — conscientious candidates remove them promptly as soon as the election is over. However, what if there was a way to have election signs while bringing down the blood pressure of those who are annoyed by them? 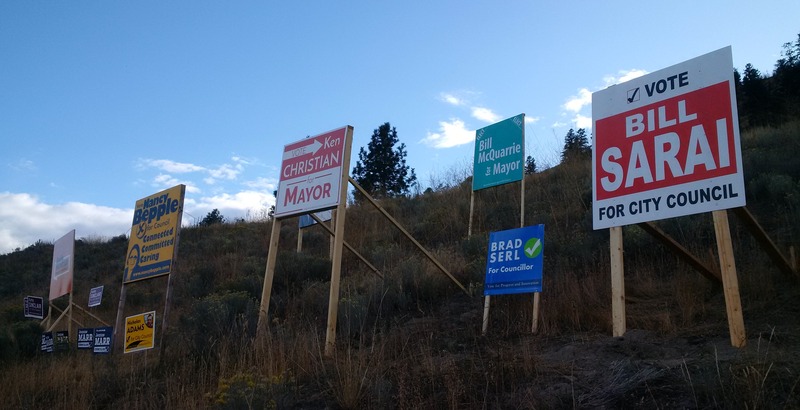 I came across a news item about a move by Penticton’s city council to limit the number of public spaces in which election signs can be planted to 13. So I’m thinking, why not designate a certain number of areas around Kamloops in a similar manner, sort of like free graffiti walls. Anywhere within these taped off areas, candidates could fill their boots on signs but otherwise make them off limits. There are already restrictions on where election signs can be put — you can’t put them on boulevards, or medians or islands where they might puncture a water line, for example. Setting rules that restrict the signs to certain locations would keep things neat and tidy, and actually make it easier on the candidates by reducing anxiety over having to out-do the competition. Election signs do serve a purpose. They generate name recognition, and name recognition is important in elections. Signs can also increase voter turnout. So let’s hang on to them but corral them into a few high-profile areas based on geography and traffic, and keep them from spreading here, there and everywhere. That should make everybody happy. One sign per candidate, and it must be picked up within two days of the election. these signs are just more visual pollution, and we don’t need it. Any signs should just be on cardboard. There’s no need to add to our plastics-load for a short lived campaign.